A two-hour tasting seminar of wine, served with crackers to cleanse the palate. We highly recommend eating a heavy snack or meal before arriving. Have you ever looked at a wine list at a high-end or farm-to-table restaurant and thought, "is this the name of the grape or the winemaker? ", "what the heck is an orange wine", or "I have no idea they made wines in Slovenia"? If so, you are not alone. In this class, wine and cheese expert and former wine bar manager of ten years Kirstin Jackson will break down the infamous, baffling wine list. We'll dissect a few of the wine lists of the best restaurants in town, sample and learn about about Sommelier wine darlings and popular wine trends you'll see on BTG (by-the-glass) lists, and talk about how to order the best wine for you and your dining companions. 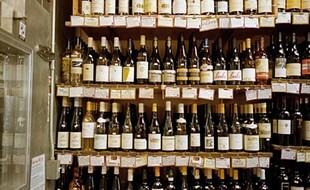 The class material will also be applicable to choosing a bottle in wine shops. To illustrate all points, of course, we will drink wine. Expect to leave informed, refreshed, and able to order like a true wine geek. As there will be a fair amount of wine, please be sure to have an early dinner or snacks before class.